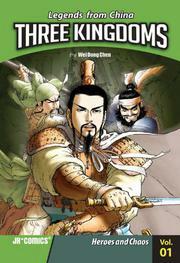 An alliance of warlords forms and collapses in this graphic adaptation—the first of 20 volumes—of a renowned 700-year-old Chinese historical novel. Set against the chaotic collapse of the Han Dynasty about 1,700 years ago, the opener introduces the three wandering warriors Bei Liu, Yu Guan and Fei Zhang, who will play central roles in later episodes. Here, they associate themselves with Cao Cao (another major player), a warlord who has joined with 16 peers in a hopeless effort to stop Han general Zhuo Dong from setting himself up with a puppet emperor. Claiming to use a classic style, the illustrators create finely drawn, delicately colored panels of, usually, facial close-ups and men in exotic armor; martial sound effects and dialogue appear in jagged balloons. While there is action aplenty, aside from occasional scratches, there are no wounds and very little blood to be seen. The graphic-panel chapters are interspersed with prose recaps, historical summaries, character introductions, maps, a dynasty chart and side drawings. Western readers unfamiliar with the original novel or the historical events on which it is founded will find it next to impossible to keep the teeming cast straight, particularly as the plot is a patchwork of melodramatic confrontations and sudden scene switches.